Race leader crashes in final 10 kilometers, while headbutts see sprint victor relegated at Tour Down Under stage 5. That was UAE-Team Emirates’ Rory Sutherland talking about 20-year-old Jasper Philipsen, who took a contested win Saturday just five days into his WorldTour career. The young Belgian, who rode last season at Hagens Berman Axeon before making the jump to the bigs, was bumped into the winner’s circle after Caleb Ewan (Lotto-Soudal) was relegated in a frenetic sprint at a wild stage at the Santos Tour Down Under. Ewan was spotted headbutting Philipsen as the pair fought for the wheel in the windy, intense stage that also saw race leader Patrick Bevin (CCC Team) crash heavily and leave for a local hospital after successfully defending the jersey. 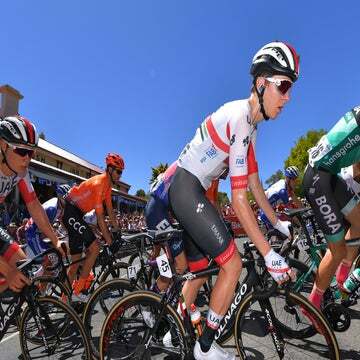 Since clicking into gear Tuesday, the Tour Down Under had been on a slow boil under extreme heat that forced organizers to trim the distances in the opening two stages. Things ramped up Friday with a climbing stage over the Corkscrew climb in the Adelaide Hills, where climbers like Michael Woods (EF Education First) and George Bennett (Jumbo-Visma) were stymied by a chasing peloton led by defending champion Daryl Impey (Mitchelton-Scott) and Bevin. The leading pair gained five more seconds in time bonuses in Saturday’s sprinter stage to set them up nicely going into Sunday’s finale up Old Willunga Hill. Everything looked to be leading up to a routine sprint finale until things ramped up. But this is the WorldTour, and nothing is routine. The pack splintered as Jumbo-Visma tried to drive a wedge in the pack with about 20 kilometers to go. That tension folded through the pack and someone crossed wheels with about 10km to go. Riders fell like dominos, with race leader Bevin taking the worse of it. Bloodied and bruised, he could barely stand as the peloton barreled down the road at 75kph. Bevin remounted a replacement bike and opened up a desperate chase. No one was waiting around to see who was left behind. It did appear as if the pace lightened ever slightly, giving Bevin a better chance to chase back on. Though hobbled, Bevin used his time trial chops to fight his way back to the team cars. After a few dubious follows (the race jury looked the other way) Bevin was back on the wheel. Bevin doubled over in pain at the line and was immediately transported to a local hospital for X-rays. The sprint turned into a fierce battle of positioning. With Peter Sagan (Bora-Hansgrohe) and Elia Viviani (Deceuninck-Quick-Step) each already with wins, it was up to Ewan to step up. The Australian jostled with Belgian wunderkind Philipsen to grab Sagan’s wheel. Ewan butted his head twice to beat back Philipsen who was trying to come underneath, and then made a long sprint to win the stage. The sweet taste of victory didn’t last long. The UCI jury reviewed the video, and word was quickly passed around that Ewan was relegated. The winner’s podium was on hold while the jury reviewed the film, and just five days into his WorldTour career, Philipsen suddenly had his first win. Lotto-Soudal didn’t see it that way. There was no immediate reaction from Ewan, but sports director Mario Aerts said Ewan was defending his position in the sprint. It was just another wild day of racing at the 2019 season opener at the Tour Down Under. The GC will be decided on a finishing climb up Old Willunga Hill, where Richie Porte (Trek-Segafredo) enters as the stage favorite. The big question is whether or not Bevin will be at the start line Sunday or if Impey can fend off the climbers at the finish line.